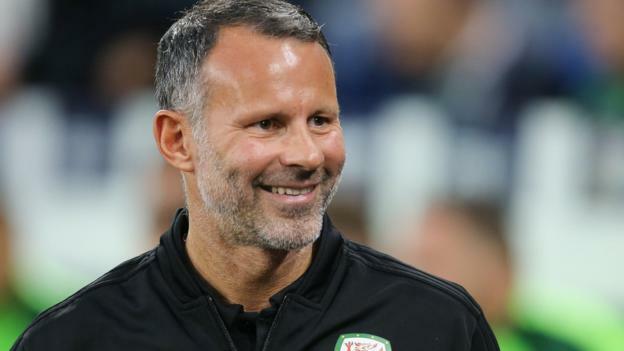 Wales manager Ryan Giggs told his “magnificent” team to stay at the standard that helped them hammer the Republic of Ireland 4-1. The Uefa Nations League win was Giggs’ first competitive game in charge. “The lads were magnificent, some brilliant goals and great football. I can’t be much happier,” he told Sky Sports. Giggs’ appearance record for Wales as a player made his appointment a divisive one, but fans sang his name at Cardiff City Stadium in his first home match as the national team manager. And the former Manchester United winger will surely hope for a repeat of Thursday’s display when they travel to face Denmark on Sunday after agreeing they had “set a benchmark” against the Republic. “I said to the players: ‘The bad news is you have to keep to that standard,'” he added. “It’s as simple as that. When you drop below those standards, you’re letting me down and you’re letting yourselves down. “It’s not easy because there were some really good performances and, as a team, they performed well. A 1-0 home defeat by the Republic of Ireland in October 2017 ended Wales’ World Cup qualification hopes, but this was a totally different display by a revived team. Lawrence set the tone with an emphatic sixth-minute finish from Joe Allen’s through ball, and Bale whipped in an even better second goal from the edge of the area after a raking cross-field pass from Ben Davies. The hosts 3-0 up before half-time as 17-year-old Ethan Ampadu set up Ramsey for a low finish. Roberts’ crisp left-footed strike in the second half put Wales four goals up, before the Republic managed a consolation of sorts when substitute Williams seized on an error by Ramsey to score. Real Madrid forward Bale – such a key figure under Giggs’ predecessor Chris Coleman as Wales reached the semi-finals of Euro 2016 – said there was “a lot to enjoy” about the performance. “We had to put in a good performance in the first home game of the new regime,” Bale told Sky Sports. “We wanted to show what we’re capable of and make a statement. Lawrence added: “It was a good one to play in, the fans were amazing and we put in a performance for them. Have Wales unearthed a new star? Giggs reserved special praise for Chelsea midfielder Ampadu, who assisted the third goal. “Ethan is a talented player,” said Giggs. “But more than that, as a person, he’s so balanced and mature for such a young player. He’ll be a magnificent player.